If you are looking to balance your testosterone levels, exploring the world of medicinal mushrooms may be of benefit to you. In recent years medicinal and edible mushrooms have become increasingly popular throughout the world, with research showing benefits in immune function, cognitive function and endocrine and hormone health. 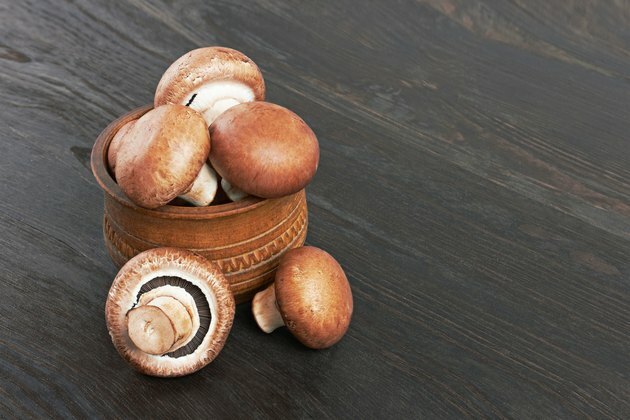 Mushrooms contain active compounds which affect testosterone levels and can inhibit or stimulate testosterone production, depending on the mushroom species. Consult your physician before using mushroom products. Agaricus bisporus, the white button mushroom, is the most easily cultivated and widely consumed mushroom in the world. In a study published in "Cancer Research" in 2008, researchers from the Beckman Research Institute looked at the antihormone activity of agaricus in animals. Agaricus reduced estrogen and testosterone production and had a positive effect on cancerous tumours. Researchers concluded that the conjugated linoleic acid found within white button mushrooms likely has an anti-aromatase action in the body, reducing both testosterone and estrogen levels. Ganoderma lucidum, the reishi mushroom, is growing in popularity around the world as a natural cancer treatment. According to a study published in "Bioorganic and Medicinal Chemistry" in 2006, researchers from Kyushu University in Japan tested ganoderma and its effects on testosterone production. Ganoderma contains oils called triterpenoids which significantly reduced the production of 5-alpha-reductase -- a hormone which increases testosterone production, and is an important factor in benign prostate growths and prostate cancer. Researchers confirm that ganoderma may be a beneficial treatment for prostate disease in men, although more research is required to confirm the clinical benefits in humans. Tremella mesenterica, the yellow jelly mushroom, is an edible mushroom that has been used traditionally in the treatment of diabetes and other health problems. In a study published in "Archives of Andrology" in 2005, researchers from Changhua Christian Hospital in China made an unexpected discovery. While the fungus had no affect on the blood sugar of diabetic mice, it did significantly reduce hormone levels. Tremella reduces the production of both progesterone and testosterone following ingestion, without causing toxicity. While the effect was potent, testosterone levels returned to normal four hours later. Cordyceps sinensis, also known as the caterpillar fungis, is native to Asia and used in traditional Chinese and Tibetan medicine for a range of medical problems. In a study published in "Life Sciences" in 2003, researchers from National Cheng Kung University in Taiwan tested the effects of cordyceps on testosterone production in mice. Cordyceps had a significant effect on testosterone production in the mice tested, stimulating increased testosterone levels from Leydig cells in the animals' testicular tissues. Researchers concluded that cordyceps may offer future treatment for reproductive problems in men. Human clinical trials are still needed.